Inside Mac Games has posted a new review of Deus Ex Human Revolution - Ultimate Edition, brought to Mac by Feral Interactive. Developed by Eidos Montreal and published by Square Enix for games consoles and Windows PC, Deus Ex: Human Revolution is a prequel to the classic Deus Ex. The game has moments of brilliance when you figure out how to combine augmentations in useful ways. For example, if you have turret hacking and the strength upgrade, you can flip the switch on a turret, then pick it up and walk around with your own personal heavy duty machine gun. Have an SMG or assault rifle with the curving bullets upgrade? Turn on your x-ray vision to automatically target foes behind walls or cover without waiting for them to appear. Have the upgrades to breathe in gas or laugh at EMPs? Toss gas and EMP grenades with reckless abandon as you shrug it off harmlessly. Have the high jump, silent falling and cloak? Leap up to a high place, sneak into a window and knock out two guards just behind it. In honor of Aspyr Media's digital download release of Quake 4, the Game Agent Blog recently posted a new list of tips and tricks for success in the multiplayer arenas of the sci-fi first person shooter. The guide includes a variety of tips about general strategy as well as specific skills to cultivate like strafe jumping, crouch sliding, and wall climbing. After you’re done defeating the Strogg and saving Earth from annihilation in the single player campaign for Quake 4, you’re bound to move onto the fast-paced frag fest that the multiplayer has to offer. And while what you’ve learned battling your way through Stroggos kept you alive in the single player campaign, the multiplayer is a whole different bag of tricks that you’re going to have to master if you don’t want to be getting blown up all the time. GameAgent is here once again to help ease the transition from a grunt in Earth’s army fighting the Strogg to a lean-mean fragging machine against real people in the multiplayer with some tips and tricks that may prove useful to you. Head over to the link below to read more. Macgamestore.com has announced the addition of The Cross Formula to its growing list of game titles available for download and purchase. The puzzle adventure game puts players in the role of an amnesiac seeking to prove he is innocent of murder. The Cross Formula features 47 scenes to explore and 32 unique puzzles to solve. You wake up in a roadside motel with no memory of who you are. The police suspect you of murder. Search for clues in this Puzzle Adventure game as you retrace your steps back to an old diner, a UFO fanatic’s trailer, and a secret military base. Along the way, bits of a cryptic code flash through your mind. What is this strange formula and why does it have such a powerful hold over you? Solve puzzles, talk with quirky characters, and look for items to piece together the story of who you really are, and what really happened. 47 scenes to explore that take you off the beaten path. 32 unique mind-stretching puzzles to solve. An old style adventure accessible to everyone. Unique mind-stretching puzzles to solve. Intriguing story, quirky characters, and unusual settings. Perfect if you're in the mood for something different. The Cross Formula requires Mac OS X 10.5 or later and an Intel Mac. It is available now for $6.99 (USD). 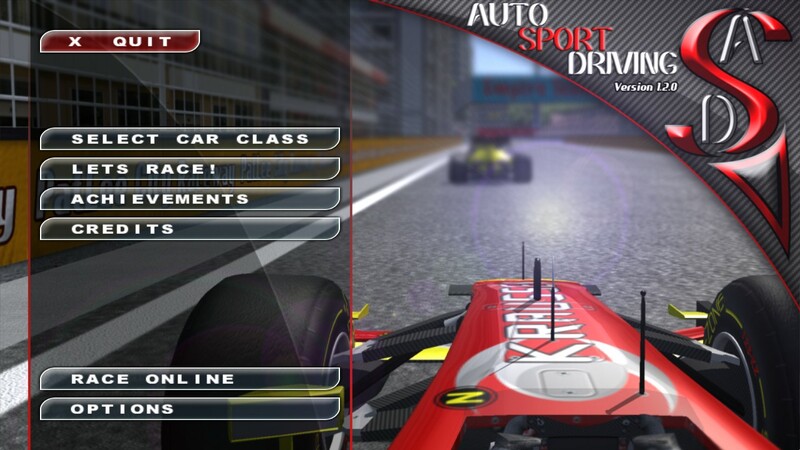 SiniScope's Auto Sport Driving, a driving simulator available exclusively for Mac OS X, was recently updated. Version 1.2 of the racing title features the introduction of a new car set, dubbed the 357F series. This F1 styled race car adds an even faster option to the available collection. As with previous vehicles, the new car is playable on all tracks. Version 1.2 also offers some tweaks allowing better accessibility for new players. I recently spoke to lead developer Jason Frabotta who told me that this update is one of many planned for the coming year and that he has received positive feedback from early testers. Jason also said that through these updates he hopes to transform Auto Sport Driving from a "small indie game to a very polished quality game." For more information about the game check out the site below.